Well it’s been a bit of a restless month at the Flying Bike Cooperative Brewery, out here just short of the edge of town, in the heart of Greenwood, a mixed neighborhood of traditional and alternative lifestyles. We know the sun is on its way--sometimes it even drops by for a brief preliminary visit—and that makes us anxious to be prepared. That’s why we’ve got co-op member Austin Rood’s Banana Seat Hefeweizen on tap, just in time for you to settle down with a large one at a table on our little patio’ish space on the next sunny day. The secret is, it’s got a bit of rye in it. Otherwise it’s a straight-up classic hefe, with the classic German yeast. Don’t miss it. 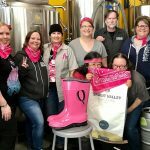 That “We Can Brew It” Pink Boots brew, designed and brewed by an indomitable team of women of the Flying Bike, has taken a while to catch on, partly because it needed time to come into its own, and partly because we didn’t quite know how to define it. But then it came to us: of course! It’s a strong ale! 7.5% alcohol, featuring the intriguing complexities of 100% Skagit Valley Maltings malt. If you haven’t tried it lately, you haven’t tried it. We’re very happy that Opiny the Yelper New England-style IPA was a great success--so great that we drank it all already. But have no fear, for the people have spoken, and the people are the co-op. Therefore our next New-Englandish-style IPA will debut immediately. “Second Opinion”--get it?--features Columbus, Mosaic, and Citra hops, for a bit of a more classic hop profile, along with that soft, welcoming palate of the style. In fact this very day Agustin (along with his weekly bottling duties) is helping brew our next hazy pale, to come off the bench when the Mr. Whale is exhausted some time in late May. We’ve been sitting on a bit of a store of unique and unusual hops, and this will be their chance to show us what they can do. Orange/mango/stone fruit is the prediction. But we don’t quite know. That’s the beauty. 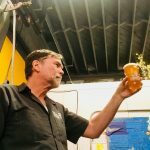 Speaking of Agustin Sanchez, he’s been working Thursdays in the brewery, while our newest friend on the brewing side, Jesse Young, will be working weekends and Wednesdays, while beertender extraordinaire Jenna Lindner has taken on the crucial, wearying task of keeping your beer lines clean. This is the new team that’s come together to keep things going in the brewery and keep Your Humble Brewer on the straight and narrow. Thank them when you see them. Come on in--the doors are open!